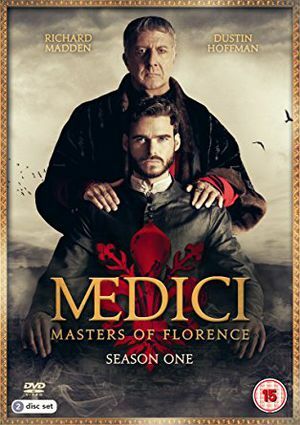 The series Medici: Master of Florence is a family drama of the famous Medici household that shaped the Italian Renaissance in the 15th century and continues to be influential long after. The series begins with the death of the household patriarch, Giovanni di Bicci de' Medici who may have died of poisoning, and the subsequent control of the family business by Cosimo de' Medici, who then led the household along with his brother Lorenzo de' Medici. This article examines the historical accuracy of the first season of the series. The series begins with the poisoning of Giovanni di Bicci de' Medici and Cosomo de' Medici, his son, taking over the by then well known and established Medici bank. By this time, the business was flourishing and among the largest in Europe with branches in many cities. The family also had close connections with the papacy, as they were responsible for the finances of the Pope. Throughout the series, flashbacks show Giovanni training his children, Cosimo and Lorenzo, the family banking business and being very controlling of their lives, including who they could marry. Cosimo was influenced to marry Contessina de' Bardi, which ended up being a sometimes strained marriage, although Contessina was loyal to Cosimo. Lorenzo also had great tension with his father, also involving his love life. Two key plots play throughout the first season. First, Cosimo was elected to an important seat in the Signoria of Florence, which was effectively its government. This caused great jealousy among his rivals, namely Rinaldo degli Albizzi, who headed the Albizzi family. The second key plot was the murder of Cosimo's father that was investigated by Marco Bella, a close family associate. The rising power of Cosimo creates great jealousy among some of the Signoria, with Rinaldo eventually successfully accusing Cosimo of usury. Although they fail to have Cosimo sentenced to death, he is exiled to Venice. After some time, Cosimo returns to Florence as things turned poorly for the city, where it was in financial difficulty and mercenaries were causing trouble, leading them to invite back Cosimo to the Signoria. In his return, Cosimo eventually is successful in exiling his Albizzi rival, who had taken control of the government in Florence. Tensions in the investigation of Cosimo's father murder boil over as first Lorenzo and then Marco are accused. Meanwhile, Albizzi himself is murdered as he tries to begin his exile, which implicates Cosimo since he was seen as his main rival. However, that was a plot by Jacopo de' Pazzi, another member of the Signoria and prominent family head in Florence. He had Albizzi killed to try to frame Cosimo so he could take the banking account of the Papacy. This failed when a letter is uncovered that implicated Pazzi. Lorenzo, Cosimo's brother, however, was killed after he and Marco captured a Pazzi assassin. Nevertheless, the Medici family gains prominence again as they regain the Pope's favor and ultimately Florence's. The murder of Giovanni is finally uncovered when the Medici's close banking associate who kept records, Ugo, confessed to murdering Giovanni because he was ordered to kill a lover of Lorezo's that was pregnant with Lorenzo's child. His regret in this led him to kill Giovanni. Figure 1. 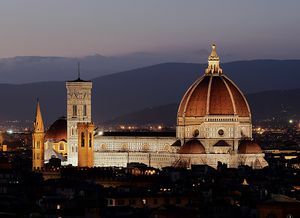 The dome was designed and built by Brunelleschi, who was supported by Cosimo. Cosimo de' Medici (1389-1464): The series depicts him as a wise and cunning head of the Medici family who also began the tradition of patronizing the arts that the Medici family became known for in the Renaissance. Historically, this was certainly the case and he was often seen as the first great head of the Medici family in the Renaissance period, although his father Giovanni helped to establish the Medici bank. The series shows Cosimo learning much from his father, but family tension also created a sometimes strained relationship. In particular, Giovanni was keen on having his sons, in particular, Cosimo, marry women that provided greater power to their family. Cosimo's love of the arts was shown early on, although his father was seen as someone who discouraged such pursuits. Cosimo is historically known to have commissioned Donatello's David, which was a controversial piece for its time. He is shown as supporting Filippo Brunelleschi in his work in completing the great dome of Florence's cathedral. While Cosimo's support is accurate, others in Florence also support Brunelleschi in his masterpiece (Figure 1). Giovanni di Bicci de' Medic (1360-1429): He was the chief founder of the Medici Bank that ultimately gave power and wealth to the Medici family. Much of the business acumen that Cosimo learns comes from Giovanni, which is likely true given Giovanni's great success in establishing the bank and making the family perhaps the wealthiest in Florence by his death. The first episode suggests Givoanni was murdered, but there is no historical data to support this. Furthermore, the series depicts his death in a warmer season, but he died in winter. Contessina de' Bardi (1390-1473): She is depicted as having to marry Cosimo, where both were unhappy for a period but did eventually learn to live with each other. As the series depicts, she was from an old noble family that, in fact, had lost much of their wealth. Cosimo marries her for her family connections and name, while Contessina is married to Cosimo for his family's wealth. The series depicts her getting involved in the political matters of the city and saving her husband from execution, prior to Cosimo being exiled, but in reality, this likely never happened and others intervened to save Cosimo. Lorenzo de’ Medici (1395-1440): He is the younger brother of Cosimo who helps run the bank with Cosimo after their father's death. While he did, in fact, run the bank's business in places such as Rome, helping to lead that important branch of the bank, he likely died of natural causes and was not murdered. Marco Bello: In the series, he is an important associate of the Medici family. He leads the investigation of the murder of Cosimo's father. However, he later leaves Florence because of the false accusations against him by Lorenzo and Cosimo in their father's murder. Nevertheless, he retained loyalty to the Medici family by helping to uncover the Pazzi plot. There are no historical documents about his existence. The series has a mixed record in depicting historical events. Many of the buildings, for instance, the famous Florence Duomo, was shown, but the facade depicted was not built until the 19th century. The series takes liberty with some important historical facts, such as how characters, including Lorenzo, Giovanni, and Albizzi died, but in reality, all of them died natural deaths. Cosimo's wife probably was not as involved in politics as depicted, given that society was very patriarchal at this time, although she may have used some indirect influence. The Albizzi was shown as being against the type of art the Medici tried to promote and actively tried to stop work on the dome in the cathedral, but we know little about this. Other facts are at least partially accurate, such as the exile of Cosimo, the decision to exile Albizzi, and the war with Milan shown. Venice was, in fact, where Cosimo did go into exile. Furthermore, this likely was the main reason why Cosimo was invited back to Florence, as Cosimo had withdrawn his banking activities from Florence, helping to enrich Venice as capital began to flow there. The slave Cosimo obtains as a gift from Venice, Maddalena, did exist and he did, in fact, father a son with her, who did later become an important priest supported by the Medici family despite being illegitimate. The family's rise during Cosimo's father's time is accurate, and they did influence who became pope through manipulation of cardinals. It is not clear, however, that Giovanni was against patronizing the arts. He simply may have been more focused on enriching his family and establishing the bank. He likely did influence who his sons would marry, but this was not unusual for the time and most families would often marry their children off due to the influence of the family patriarch. It is true, however, that Cosimo began the tradition of patronizing the arts and architecture that the Medici family became known for in the Italian Renaissance. Indeed, Cosimo was one of the most important figures in the early parts of this period. ↑ For more on Cosimo, see: Kent, D. V. (2000). Cosimo de’ Medici and the Florentine Renaissance: the patron’s oeuvre. New Haven: Yale University Press. ↑ For more on Giovanni, see: Hibbert, C. (1974). The rise and fall of the house of Medici. London: Lane. ↑ For more on Contessina, see: Franklin, M. A. (2006). Boccaccio’s heroines: power and virtue in Renaissance society. Burlington: Ashgate. ↑ For more on Lorenzo, see: Strathern, P. (2007). The Medici: Godfathers of the Renaissance. London: Vintage Books. ↑ For more on the Medici family history and Florence's history, see: Hale, J. R. (2001). Florence and the Medici (New ed). London: Phoenix. ↑ For more on Cosimo's family history, see: Ewart, K. D. (2006). Cosimo De’ Medici. New York: Cosimo Classics. This page was last edited on 26 February 2019, at 20:08.